There are so many things, we take for granted. And one of them is food cooked by our mothers. I really wish I can cook many more recipes from my mother’s repertoire. Amen to that! Only now with more and more emphasis on healthy and clean eating, I have started realising the importance of some recipes which my grandmothers and mother cooked. One of them is using jaggery, grains like bajra and makka. After making gur ki kheer a few weeks back, I made bajre ki kheer for a potluck which we did on the occasion of Makar Sankranti. I was initially not sure about the reception the pudding would get among my friends but surprisingly, everyone took back helpings home for their family. They also wanted their families to taste and enjoy something different and healthier. De-husking the bajra is also an important step. It sounds confusing but definitely not when you do it. You may be getting de-husked bajra in your grocery shop, so do check it if this doesn’t work for you. It is done by soaking pearl millet or bajra in a wet cloth for 15-20 minutes. Moisture will loosen the husk of millet, making it easy to remove. Give soaked millet a very quick pulse in mixer, you don’t want powder, but just enough to separate loosened husk. You can do the same step in a mortar and pestle if you have one instead of a mixer. Adding sweetness through sugar or jaggery is optional, I chose jaggery as I wanted to make good use of season. There are few points which we need to keep in mind while making jaggery kheer – stirring is important so that kheer doesn’t get stuck to the base of the pan, and once again reiterating, add jaggery syrup in kheer only when it has completely cooled down, else the milk can coagulate. 2. Pressure cook the cleaned millet with 1 cup of water for 2-3 whistles. 3. In a thick bottom pan or wok, add boiled millet and milk. Allow it to cook on slow flame, stirring often. Stirring is important so that it doesn't get stuck to the base of the pan. It will take about 40-45 minutes for bajra to cook as well as milk to reduce. 4. In a small pan, add ½ cup water and crumbled jaggery. Allow the jaggery to cook and melt completely. Remove from flame and set aside. 5. When bajra is tender and blended well with milk, add cashews, almonds and raisins in it. Mix well. Add cardamom powder and turn off the flame. Allow the kheer to cool completely. 6. 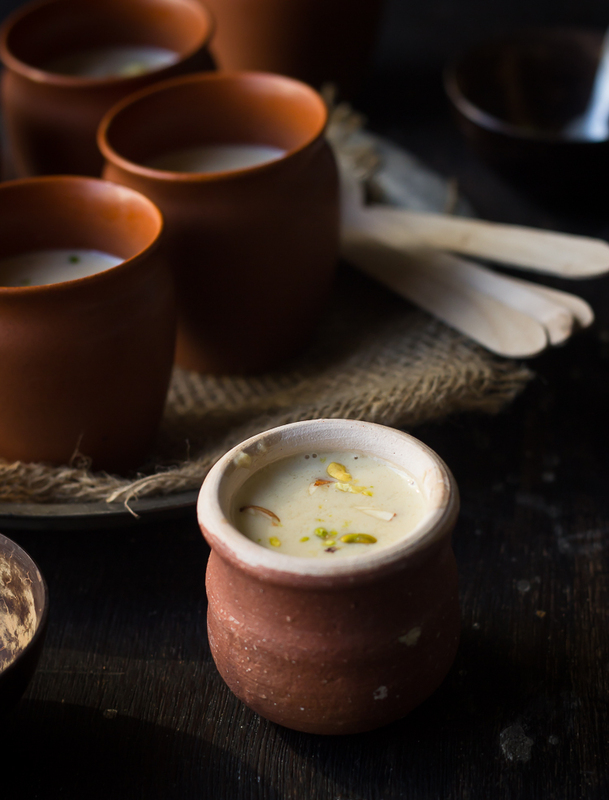 When the kheer is completely cooled down, strain jaggery syrup and mix well in the kheer. Serve chilled and garnish with more chopped almonds and cashews. Add jaggery syrup in kheer only when it has completely cooled down, else the milk can coagulate.